Intellijoint Surgical offers easy-to-use and affordable orthopaedic solutions for surgeons. The company’s key product, PelvAssist™, is a surgical tool that measures the precise position and orientation of hip implants and provides a digital readout. It is improving patient outcomes and offers surgeons and hospitals a cost effective and reliable improvement to traditional hip replacement technology. What started as a course project by three fourth-year University of Waterloo mechatronics engineering students has turned into a tool that can improve the lives of hip implant patients around the world. Armen Bakirtzian, Andre Hladio and Richard Fanson learned that orthopedic surgeons needed a simple way to take the ‘eye-balling’ out of the surgery process after talking to Armen’s father, an orthopedic surgeon. So, the trio developed a device that provides an accurate balance measurement, much like a level that is used to put up a shelf. In 2010, they decided to commit to entrepreneurship and bring PelvAssistTM technology to life. 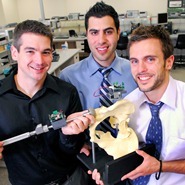 Intellijoint Surgical (previously Avenir Medical Inc.) received funding through the Futurpreneur Canada Spin Master Innovation Fund pilot to get their business running. They also received a wealth of financial knowledge and advice from Futurpreneur Canada Mentor Sandy Robertson, who was instrumental in helping to find investors. How has your mentor contributed to your success? Our Futurpreneur Canada mentor, Sandy, provides us with a wealth of experience and knowledge in many aspects of our business. Given our engineering background, his guidance has given us a balanced perspective to grow our business. We really have learned that entrepreneurship and innovation go hand-in-hand.